19th-century business tycoons made Lenox a popular summer resort. It's still a popular getaway for the wealthy and culturally sophisticated. To summer visitors Lenox, 130 miles (209 km) west of Boston, 42 miles (68 km) southeast of Albany NY and 144 miles (232 km) north of New York City (map), is synonymous with Tanglewood, the spacious estate on the town's outskirts that has been for decades the summer performance center of the Boston Symphony Orchestra. Each weekend Lenox fills to capacity with music lovers from Albany, Boston, Hartford, Montréal, New York City and beyond. Lenox's appeal is almost as bright mid-week (Sunday through Thursday nights). Tanglewood offers many smaller concerts by up-and-coming musicians. Lodging mid-week is much easier to find, and a lot cheaper when you do find it. Here's a bit of Lenox history, here's how to get to Lenox, and here are things to see and do, including information about Tanglewood. 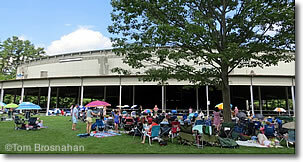 The Koussevitsky Music Shed at Tanglewood, well attended for a summer concert.